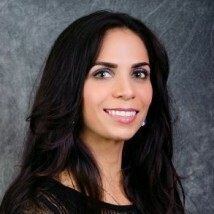 Soyre, or “Nina” as we call her, is a Licensed Esthetician and Facial Specialist by the Florida Board of Cosmetology and Certified by PCA Skin and Viora. With a background as a Doctor in Dentistry from University of Zulia in Maracaibo, Venezuela, she decided to combine her passions for cosmetic dentistry and skincare in order to provide personalized services for all of her patients with the ultimate goal of achieving a true complete oral and maxilo-facial health benefit. Nina believes what sets her apart from other professionals in this field is her personal touch and how conscientious and detailed-oriented she is about what she does. She really takes the time to make certain every patient feels comfortable and satisfied, and that they leave feeling more beautiful and more relaxed than when they arrived. As a self-professed “beauty junkie,” she continues to enjoy searching for the best in unique and “must have” beauty resources. Every product she recommends has been tried, tested and hand-chosen by Nina herself. Her specialty is also eye brow shaping. It can completely transform your look, an almost mini eye lift! Nina considers it a “blessing and a priviledge” to have found such a fulfilling career by connecting with her patients and establish a trustworthy and personal attention for their needs and requests.